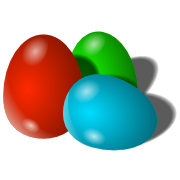 Lately i got in a frenzy of drawing game marbles with Inkscape so i couldn't stop drawing some easter eggs, which are pretty much a special case of those marbles (just shapes as an ovoid). This seems logical, as today is the traditional day for painting eggs for easter, but not so logical considering i am definitely an atheist. My only excuse: i will enjoy this upcoming 3 days week-end and the traditional festive meals (but still feeling a little dirty for exposing those religious symbols).